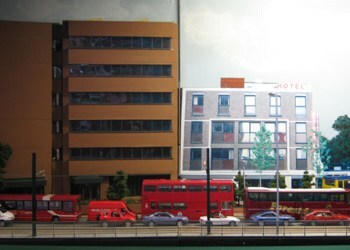 The model is a diorama of a section of Wellesley Road, Croydon, viewed as from the west. The layout was constructed inside four weeks in time for the Society’s Annual Exhibition in October 1999. Operation of the layout is entirely automatic. Operation of the layout is entirely automatic (fingers crossed) with the tram passing prototypically from left to right through the scenic area before reversing behind the back scene under reed switch control. One complete cycle takes about 1½ minutes. 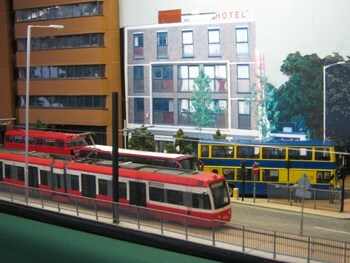 All scenic detail is scratch built, as is the tram itself – no kits or ‘ready-to-run’ models in 4mm then existed. Only the road vehicles are kit-built or ‘out of the box’! 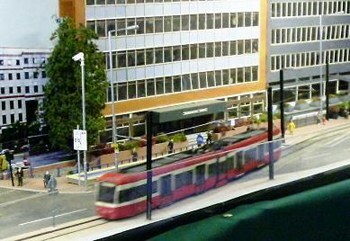 The model depicts a section of Wellesley Road, Croydon, either side of the junction with Lansdowne Road, where the route is single track with trams travelling southbound only, crossing from the central reservation to the nearside lane prior to taking the slip road, adjacent to the underpass, en route to East Croydon Station. 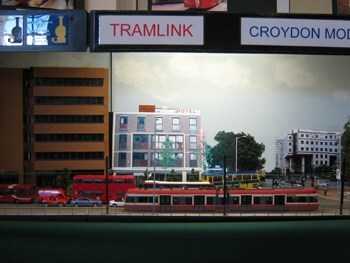 The layout was constructed for the Society’s Annual Exhibition in October 1999 when the Croydon trams were undergoing test running throughout the network prior to entering revenue service. The tram itself was constructed from scratch by one of the Society’s top modellers. Visitors to Croydon may have now noticed that Prudential House has been replaced by the Jurys Inn hotel. We have no immediate plans to update the model so it remains a snapshot in time. The layout is regularly featured at our own exhibition but has also been featured at some major events. These include Railtex 2000 at NEC Birmingham, on the TfL stand of City Transport 2001 at Earls Court, LT Transport Museum at Acton, the 2005 Festival of Model Tramways at Kew Bridge and in a Talkback Big Train DVD production for the BBC. 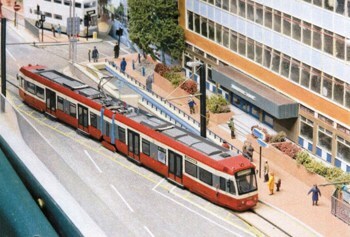 Its most prestigious outing was to the Upper Waiting Hall at the House of Commons in support of the South London Partnership presentation to MPs and transport aficionados in November 2005 in connection with possible extensions to the present Croydon Tramlink system. The layout measures 12 feet (3.6 metres) long by 15 inches (38 cm) deep.